As demonstrated here using the all-purpose Spring Collection Handbag. Decorate your home with love....and dead animals. Goo goo gajoob ga goo goo ga joob...make any sense? I didn't think so! Free face painting and balloons with purchase! Flying trucks are a common sight in Lebanon. No special oil is needed. which both alert and terrify you simultaneously. Let's just say that things are heating up. Advertising loses one of their own. What moms give their children has little to do with genetic traits. What children give their moms this year most likely will not say Exotica. 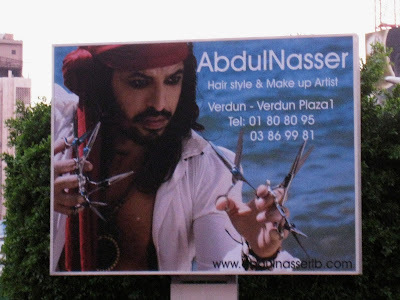 Is this Captain Jack Sparrow? Edward Scissorhands? Nope. Meet Captain Jack Scissorhands along with a crew of neatly groomed pirates, of course. The British flag T-shirt and hanging scissors.......Bloody brilliant! Innit? Can You Stand an Egg on Edge During the Spring Equinox? Maybe not, but in Lebanon you can stand a pearl earring on its end. Good news! The model sees his shadow and according to legend there will be 6 more weeks of winter! Hours in the gym with dumbbells? Or is your body from your Mama? Welcome! Make your plans now for 2010! You can't fool us, we know a real car when we see it!